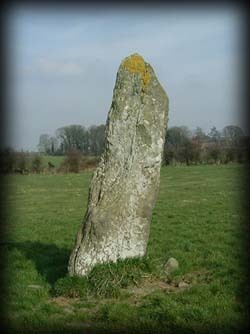 This very impressive stone stands very proud on a slight hill overlooking the surrounding fields, standing at over 3 metres high and about 1.3 metres wide this standing stone is traditionally associated with CuChullain the legendary hero of "The Tain Bo Cuailgne" an old Irish saga. 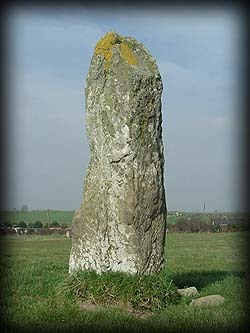 Folklore: According to legend CuChullain was mortally wounded when single handedly fighting off the army of Queen Maeve of Connacht, he tied himself to the stone to stay upright and face his enemies, who would not approach him, after a few days a raven landed on him and they realised he was dead. Situated: Near Rathiddy, Co Louth. From Ardee take the R171 north through Louth to Knockbridge go another kilometre to Rathiddy and the stone can be seen in a field to the East of the road, access is through a stile next to an information sign. Discovery Map 36: J 0064 0389. Last visit Mar 2008.